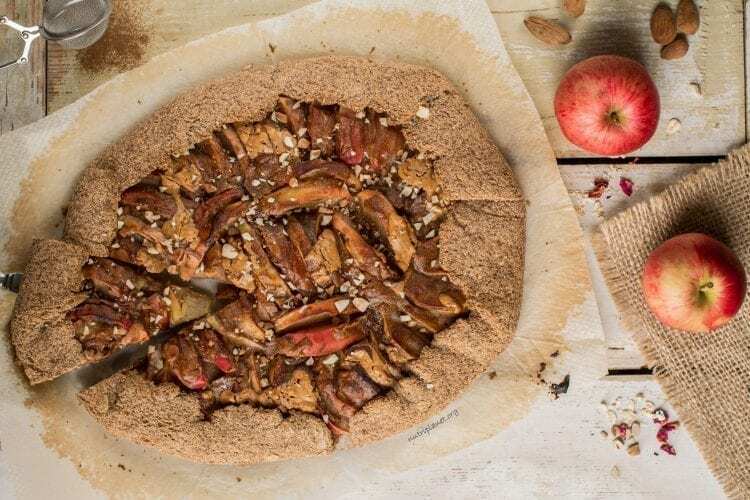 The autumn can’t go by without trying this gluten-free vegan apple pie that will fill your kitchen with heavenly fall flavours. 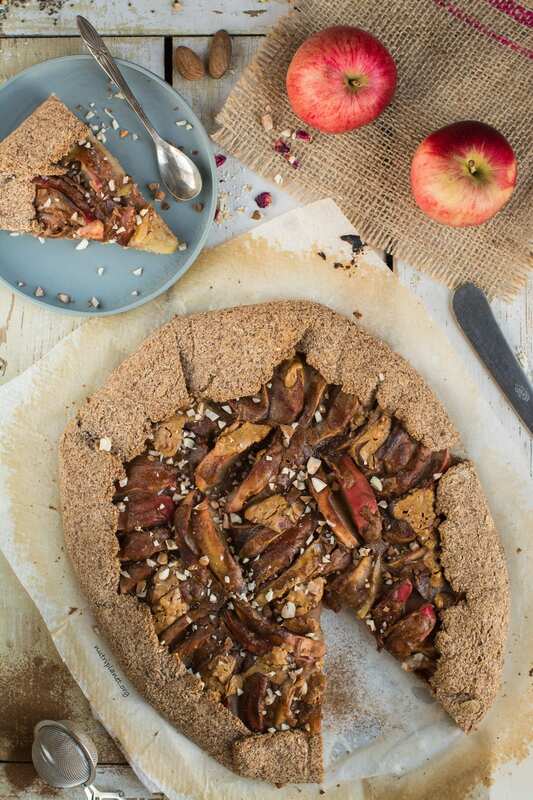 It’s an easy-to-make vegan pie recipe that even beginners can add to their repertoire. Don’t forget there’s tutorial video below the recipe! To be honest, I was so happy with the pie crust I created for my latest no yeast cinnamon rolls that I just couldn’t keep it to one recipe. The thing is this gluten-free crust is so versatile that with minor modifications it can even be used in savoury recipes (more on that in the future). So, that’s the story behind the crust of my vegan apple pie. Let’s move on to the filling! Once again, you’ll see mesquite flour among the ingredients. Let’s be honest, it has become one of my favourite natural sweeteners. So, what’s the fuss about it? About to go into oven! Should you still consider substituting it, go and read my tips below. Easy to make – rolling the dough is super easy with my technique! I can’t wait for you to try this vegan pie recipe out yourself! Definitely let me know in comments if you have any questions or suggestions. Also, make sure to tag me in social media, so that I can see your creations and feature them! Take a silicone mat, wax paper or non-stick parchment paper and place your dough ball in the middle. Now, put another piece of parchment or wax paper on top of the dough and start rolling. Roll the dough out into about 28×35 cm (11×13.8 inch) rectangle (or more like oval) and remove the parchment paper. First, slice the apples and gently mix them with lemon juice to prevent browning. Then, stir in all the remaining filling ingredients. Again, be gentle not to mash the apple slices. Mix until the xylitol has dissolved. 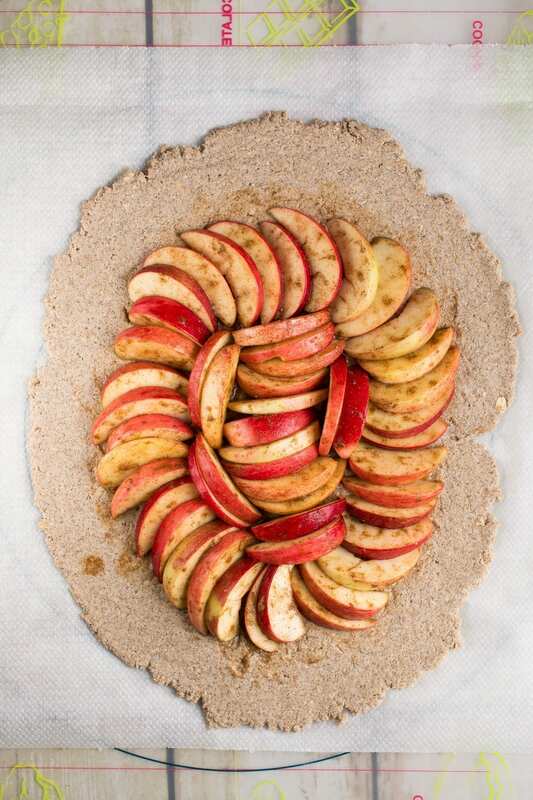 One-by-one start placing the apple slices onto the crust leaving about 4 cm (1½ inches) crust at the edge. You may follow any pattern you like. Spread the remaining liquid also onto the apple slices. 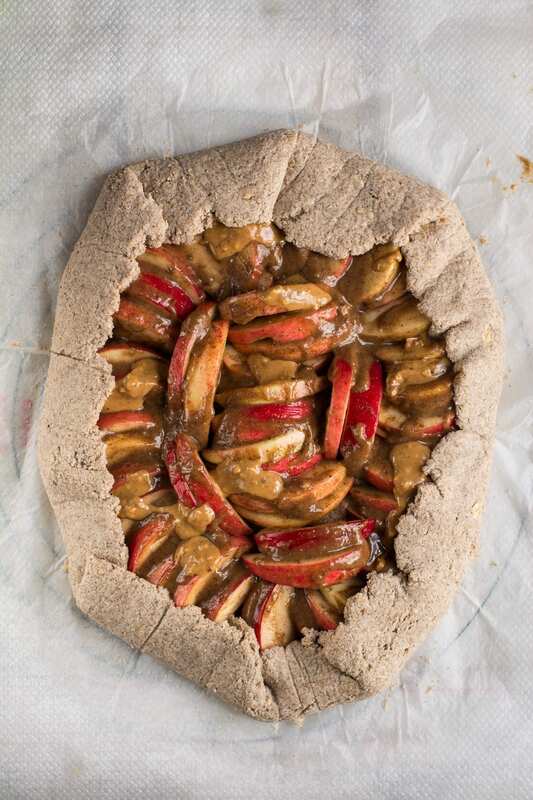 Alternatively, chop the apples into smaller pieces and pour the filling mixture onto the crust. Gently fold the edges upwards. Finally, bake the apple pie at 190°C (375°F) for 45 minutes until the crust is golden brown. Let cool fro about 15 minutes before serving. 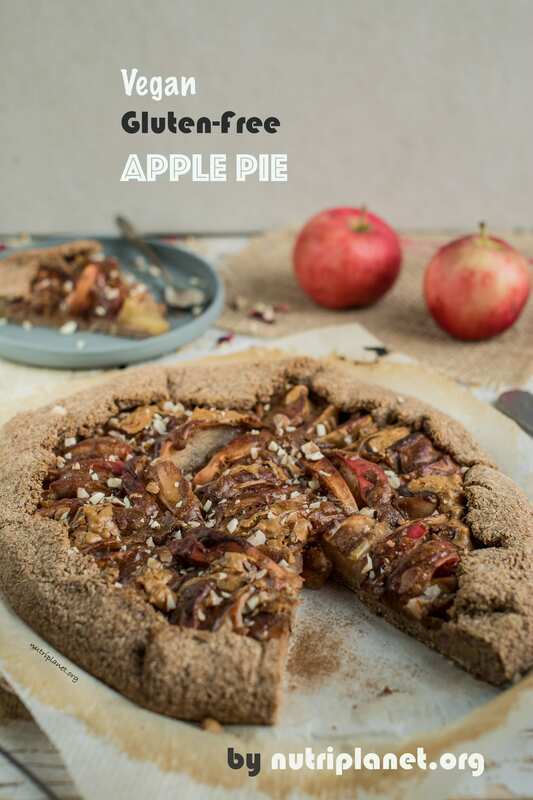 Nutritional info (⅙ of the apple pie): 247 kcal, 32.6g carbohydrates (73.5% of kcal), 6.56g fats (23.9% of kcal), 7.53g protein (12.2% of kcal), 13.6g fibre, and 12.4 GL points. Add a scoop of vegan ice cream or yogurt onto your slice. Grind your own oat flour from rolled oats using blender, grinder or food processor – measure the same weight. You can use any nut flour instead of coconut flour. However, make sure to use protein powders or reduced fat versions. It’s because ground nuts would simply be too heavy. Also, be aware that some flours may absorb more water than others. Almond milk can be used instead of soymilk in the crust recipe – I’ve tried it myself and it works equally well. If you don’t have any issues with Candida overgrowth, use any sweetener you like – brown sugar (raw cane sugar), coconut sugar, palm sugar etc. You may also use nectar or syrup, but most probably would need to add a bit more mesquite or tapioca flour. Mesquite flour gives the filling the most amazing caramel taste. However, should you not be able to get it, use coconut sugar for the caramel taste and add a bit more tapioca starch or oat flour to thicken the filling. Tapioca starch can be easily substituted with potato or corn starch (1:1). Alternatively, you could also use oat, rice or buckwheat flour. As far as nut and seed butters go, my favourite combination is almond and peanut butter, but you may use any variation you like.